Grid chaos: Sebastian Vettel leads the pack out at the start, which saw Kamui Kobayashi run into the cars around him. Create Images. 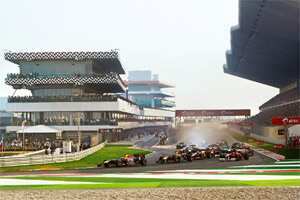 New Delhi: The inaugural Grand Prix (GP) of India did not have much riding on it in terms of the race, with both the driver’s champion (Red Bull Racing’s Sebastian Vettel) and the constructor’s champion (Red Bull Racing) already decided, but it offered plenty of thrills on the track and plenty of debutant buzz off it. Minutes before the start of the race, cricketer Sachin Tendulkar walked down the pit lane, creating a frisson of excitement among the garage crew, as well as inspiring Mercedes’ German driver Nico Rosberg to send out a gushing tweet. The front runners, pole position holder Vettel and teammate Mark Webber, McLaren’s Jenson Button and Lewis Hamilton, and Ferrari’s Felipe Massa and Fernando Alonso all got off to a good start. By the third lap, Vettel, the eventual winner, was already 2.7 seconds ahead of the pack. The 24-year-old driver became the youngest ever double world champion when he secured his second consecutive title in October this year at the Japanese GP, but he was in no mood to take his foot off the pedal. After a scorching qualifying session on Saturday, which gave him pole position, Vettel led the pack from start to finish, passing under the checkered flag being waved by Tendulkar a good 8.4 seconds ahead of Button, and 24.3 seconds ahead of Alonso. “The whole team is very hungry, motivation is not an issue," Vettel said after the win. “I am very happy, very proud to be the first winner of the Indian GP, but at the same time our thoughts are with the two very young, very committed race drivers who lost their lives." He was referring to the twin tragedy that struck motor sports earlier this month—Indycar driver Dan Wheldon was killed in a crash in October, and MotoGP racer Marco Simoncelli lost his life in a racing accident barely a week later. The only Indian in the fray, Hispania Racing Team’s Narain Karthikeyan finished the race at 17th, ahead of his teammate Daniel Ricciardo and Team Lotus’ Jarno Trulli (five drivers retired). “It was a fantastic race, very emotional," Karthikeyan said. “ I wanted to finish the race, so I did get to my objective. I developed a throttle problem early on, but I still managed to beat my teammate and Lotus. Obviously, I drive for a very small team, so if I get a better car, I can only improve." Force India also picked up two points with their drivers Adrian Sutil and Paul di Resta finishing 9th and 13th, respectively. So powerful was Vettel’s dominance on Sunday that when he set a lap record in the penultimate lap, he was told to ease off by his team for the last lap. Instead, he set a new lap record in the final lap. Red Bull Racing’s team principle Christian Horner told him: “I wish you wouldn’t go so fast on the final lap." 2009 champion Button stuck to Vettel’s tail till the end, but never got a good overtaking opportunity. “Always to have Jenson in the mirror not willing to disappear makes your life not so easy," Vettel said. Button admitted that he didn’t have a chance. “The pace was good, but as Sebastian got into his rhythm it was impossible to catch him," Button said, “But we didn’t put a foot wrong in the race." While there was little excitement between the leading three in the race, there was plenty of thrills right behind them. Hamilton had been trying to make his move on Massa for 3-4 laps before he came up inside of Massa to overtake in lap 24 and both cars collided. The drivers managed to remain in the race, with Massa being handed a drive-through penalty for the incident. Things got from bad to worse for the Ferrari driver, as he exited the race with a broken suspension in the 34th lap. “It was a very good track to drive on, but it did have a very narrow line of normal grip. Outside that it was very slippery with dust, but that is normal on any new track," Massa’s teammate Alonso said after the race. “We had problems with the curbs, we saw Felipe (Massa) break his suspension twice—yesterday (during qualifying), and then again today." There was universal praise for the new track though, and a big round of applause when it was announced that race-day attendance was 95,000. Button said it will go down as one the best circuits in the calender in the years to come, and Vettel said he enjoyed the track so much that he lost track of time. “When my engineer came on the radio and said 12 laps to go, I said bloody hell, that was quick," Vettel said.